The Konnekt video phone with easy to see buttons has a large 15-inch (38cm) screen that’s bright, has TALL text, and HUGE buttons with LARGE labels. It’s extremely easy to locate and press the ANSWER button, or the Call button of the contact you want to see. No need to rush to find your glasses each time there’s a call! 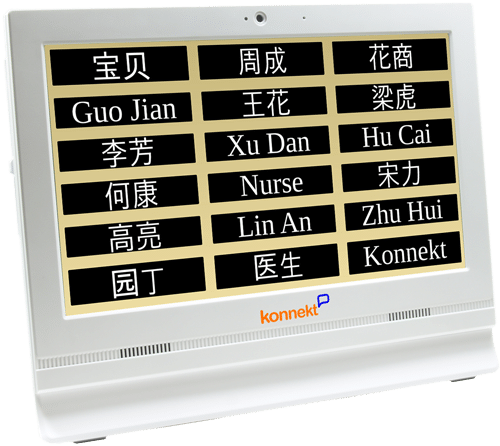 The Konnekt Videophone Call buttons, ANSWER / HANGUP buttons and on-screen messages are large and clear, with BIG text, so Videophone is great for those with poor eyesight or an unsteady hand. We setup and personalise the number of contacts and buttons, the size and style of the text, a high-contrast colour scheme to suit your eyesight, and even the language of prompts. We can adjust them for you later, without having to visit. How does it help those with arthritis, Parkinson’s, MND, ALS, CIDP, CP, MS, carpal tunnel syndrome or unsteady hands? 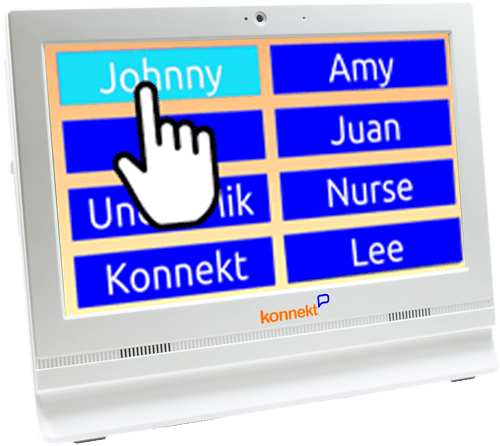 The Konnekt Videophone has HUGE one-touch buttons, an advanced touch-screen, no handset to hold, it’s LOUD and LARGE enough to use while sitting in your favourite chair, and includes installation, hidden cabling, setup, personalization, local support and Internet. See Arthritis applications or see the Konnekt Disability Videophone, designed specifically for those with an impairment.